The made-for-television version of Johanna Spyri's family classic. Heidi (Jennifer Edwards), a young orphan girl, is sent to live with her grandfather (Michael Redgrave) in the beautiful Swiss Alps. The gruff and bitter old man views Heidi at first as an ill-mannered child and an unwanted responsibility, but he soon becomes quite attached to her. When Heidi is sent to Frankfurt to be a companion to Clara (Zuleika Robson), the crippled daughter of successful businessman Herr Richard Sesemann (Maximilian Schell), Heidi and her grandfather are saddened at their parting. Heidi finds Clara’s governess, Fraulein Rottenmeier (Jean Simmons), to be a kind woman, but the spoiled Clara is mean to Heidi. Heidi soon wins her over, though, and they become good friends. Still homesick, Heidi is sent on a two-week visit with her grandfather and is later joined by Clara. It is there that Clara overcomes her fears and learns to walk. This endearing drama, with a romantic subplot between Herr Sesemann and Fraulein Rottenmeier, features exemplary acting and a magnificent music score. It is a favorite classic tale enjoyed by all ages. Fullscreen. This is a beautiful and heart warming story about love and beating all odds in life. Anyone who believes love conquers all should watch this movie. The acting is superb. I highly recommend it! Eduardo Romero - Great movie!! i grew up with this beautiful movie and would like to have it for children version. Absolutely Outstanding!I have watched this on cable 23 times, and each time it is even more endearing, beautiful, heart touching. I love the message and the beauty and courage the LORD gives to each of the characters. Would love to have this be presented more. Thank you for making the wonderful, wonderful movie and for sharing it! With kindset regards, Best, Ellen. This is a 1000 star movie! Jessica S - EXCELLENT MOVIE!! This is THE best movie of all times. It is suitable for all ages. It will surely have your attention, your emotions and your applause right to the end of the movie. I can't wait to watch it again and again!!! 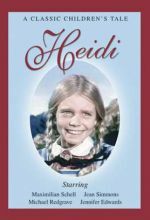 The made-for-television version of Johanna Spyri's family classic Heidi (Jennifer Edwards), a young orphan girl, is sent to live with her grandfather (Michael Redgrave) in the beautiful Swiss Alps. The gruff and bitter old man views Heidi at first as an ill-mannered child and an unwanted responsibility, but he soon becomes quite attached to her.